This is an effective play vs. a 3-2 zone, gets your players moving instead of just standing still. Start off in a 2-1-2 formation. It helps if you have a forward who can shoot the ball from beyond the arc. Place your three and four men in the deep corners to try and extend the zone. Get an entry pass to the corner from either #1 or #2. After passing to the corner, the passer will cut to the short corner, while the players on the opposite side of the corner will rotate and fill. 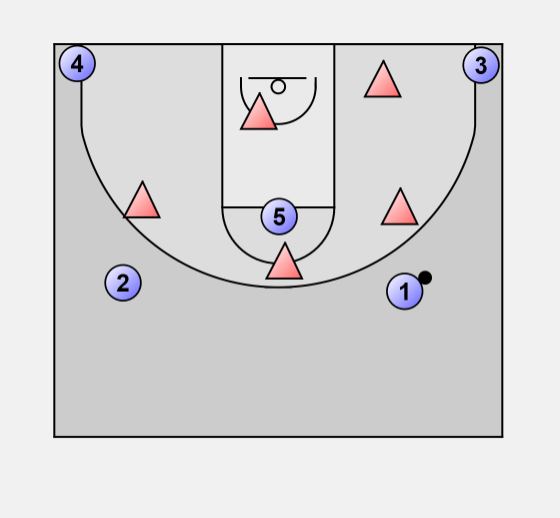 #5 can try to seal or screen the middle defender in the top of the zone to try and get open or just occupy him. #3's first look should be to the short corner. If you can get this pass then you may get an easy pass to the #5 cutting to the hoop (depending on how they are playing him). #5 should not go lower than the dotted circle, try to keep open spacing. #3 should then look to the #5 for a possible high-low with #1. 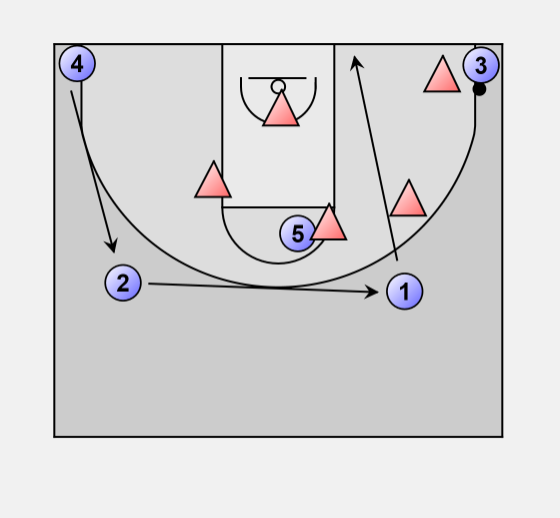 #3 may also have a drive and kick to #2 or #4 for a three, and can also reverse the ball to #2 or skip it to #4 for a possible open look. On the reversal pass, the short corner will sprint out to the other corner, and may have an open look. He may also be able to hit #5 on a seal in the high post. Once #4 passes to the corner, the sequence begins again. Most likely your open shots will come after the first or second reversal.